Is your loft a waste of space or a much-needed storage solution? Many of us use the space at the top of our house as a place for storage where items can be left and forgotten. We only poke our faces in once a year as we wobble precariously on a dodgy metal ladder, rescued from its home in the shed to retrieve the Christmas tree. With knees shaking as we scrape another mark on the wallpaper and loom over the stairs we realise all too late just how far up we are! If that sounds like the start of an episode of Casualty then YOU will recognise the need for safe access to your loft, which should be conveniently available at all times. This is where FAKRO can help, because not only do we manufacture superior quality roof windows, we’re also one of the UK’s leading suppliers of easy to install folding loft ladders. But which style loft ladder should you choose? Choice is good, but should you choose a metal loft ladder, a scissor loft ladder or the classic wooden folding loft ladder? Classic sturdy designs, easy to install and perfect for most installations. 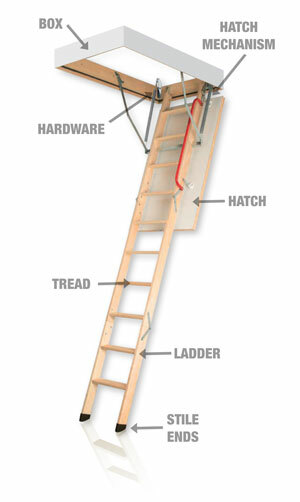 The wooden loft ladder has a pine or metal frame integrated within its box. It comes complete with linings which, in combination with a quick installation system gets the job done fast! The peripheral seal is used to ensure the ladder aperture remains airtight. The ladders mechanism significantly simplifies ladder operation. After unlocking, the hatch opens slowly without causing any hazard to the user. In addition, the mechanism maintains the hatch in fully open position, prevents it from spontaneous closing during unfolding and folding the ladder. The patented corner hinge and spring mechanism provides added rigidity to the box and prevents distortion. The ‘sandwich’ type hatch can be insulated or fire-resistant depending on your requirements. The grooves on the tread surface help protect users from accidentally slipping while using the ladder. The ladder itself is made of high quality pine and consists of three or four segments depending on your requirements – four segment ladders fold into a smaller space if lack of space is an issue. The ladder box can be of wood, metal or a combination of a wooden box / metal frame. It has been designed to enable architrave to be installed with ease if the ready-fitted option is not chosen. Peripheral single or double seals provide a good standard of airtightness. The hatch opening mechanism enables it to be in fully or partly open positions to ensure folding and unfolding are done in safety. LML and LMF loft ladders also have a hidden mechanism in the handrail which, in conjunction with that of the hatch opening, enables them to be opened or closed with a single rod. The patented corner hinge design adds rigidity to the box and prevents distortion. This ensures that the ladder will be operated trouble-free. 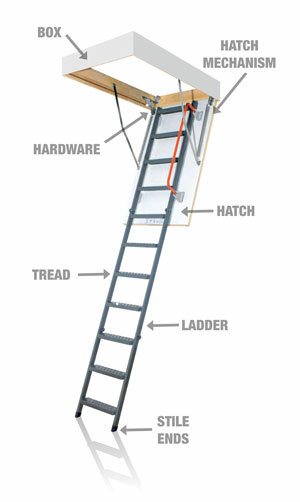 The loft ladder hatch is made of wood or metal and can be either insulated or fire-resistant. The insulation protects against heat loss while fire-resistant material protects against heat build-up caused by spread of flame. The external hatch surface is smooth to blend effectively with the visual style of any interior design. Circular embossing of the tread surface prevents slipping while the width of treads (8 or 13cm) enables them to be used safely and with ease. The special design of the metal ladder and a double connection of the ladder hinges guarantee high ladder strength. Ladder elements are powder-coated with hard wearing lacquer in grey RAL 7022 or silver RAL 9006. Some metal ladders have the final two treads left loose and with telescopic stile ends this enables adjustments of the ladder length to be made without the need for cutting. Made from plastic, these protect your floor from scratches and add to the overall ladder stability. The ladder box can be of wood, metal or a combination of a wooden box / metal frame. The box is equipped with a peripheral seal and lining as standard. The box enables a scissor ladder to be installed and adjusted quickly and with ease. The hinge mechanism significantly simplifies ladder operation. Once unlocked, the hatch opens slowly to avoid any risk to the user. It then keeps the hatch in the fully open position and prevents spontaneous spring back during folding and unfolding. The patented corner hinge design adds rigidity to the box and prevents distortion. This ensures that the ladder will continue to be operated trouble-free. Scissors loft ladders are equipped with white insulated or fire-resistant hatches, made of either wood or wood and metal as standard. The external hatch surface is smooth to blend effectively with the visual style of any interior design. The specially embossed pattern on the tread surface protects the user from accidentally slipping while using the loft ladder. The scissor ladders construction makes height adjustment a simple process with no need for cutting. It also enables the ladder to be folded to a smaller size and used in openings as small as 50 x 70cm. The elegant, modern style is achieved through use of ‘S’-shaped stringers which can also be used as handrails. And of course, it doesn’t stop there! You can also select from a collection of loft ladder accessories to make your installation complete. The loft balustrade is made of pine wood, protects the ceiling opening in the attic and makes it easier and safer to descend the ladder. The LXB-U is installed directly to the loft floor and is strengthened with flat-bars. The LXB-U balustrade is suitable for the biggest loft ladder size 86cm x 140cm, so it can be applied to all types of loft ladder without cutting its horizontal bars. Installation brackets facilitate loft ladder installation in the ceiling. Installed in the corners of the box, they add to its overall rigidity ensuring equal lengths of diagonals. Bolts are screwed into brackets guaranteeing quick and accurate levelling of the loft ladder in the ceiling. The architrave is designed to finish the installation of the loft ladder and to cover gaps in the ceiling which remain after the fitting process. The architrave elements are of solid pine wood (LXL-P) or in white (LXL-W) or PVC (LXL-PVC). This quick and simple fitting process ensures a fast, aesthetically pleasing finish of the installed Loft Ladder. In the case of PVC architrave, connection with the box does not require any nails. The LXL-PVC architrave is available in white. Made of pine, the box extension matches perfectly with the box of the installed ladder and enhances the look of the ceiling opening. In addition, in case of ceiling thickness exceeding 31cm, for 4-segment and scissors LST and LSZ loft ladders, the box extension serves as an extension element of a box height allowing for installation of the LXW upper hatch. 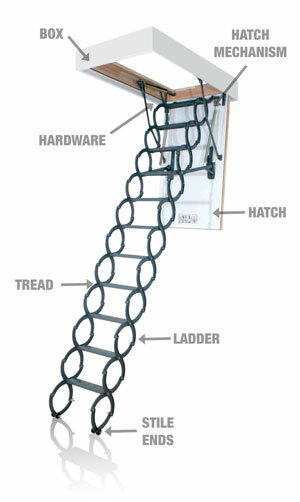 An additional tread makes climbing the ladder easier and increases comfort and safety when accessing the loft space. Made of wood, it is installed between the final tread and loft floor and is particularly recommended for use in situations where the upper hatch is installed on the ladder box or where ladders are installed in a thick ceiling. The LXW Upper Hatch prevents attic dust from accumulating on the hatch and steps of the closed ladder. It improves the overall insulating parameters and airtightness of the ladder on which it is installed. The upper hatch consists of a frame equipped with a peripheral gasket, 3.6cm thick hatch door, hardware, installation brackets, gas piston and rotational closing handle. In order to close the upper hatch from the loft side, it is possible to install an additional LXZ handle. The LXZ handle enables the LXW upper hatch to be closed from the loft side e.g. during maintenance work in the loft or on the roof. The LXS Stile Ends are finishing elements mounted on the base of the ladder, adding a smart touch to its appearance. They add to the ladder’s stability and are made from specially selected material to protect the floor from being scratched. They are available for all segment of loft ladders with wooden ladder sections (besides 4-section and LDK loft ladder). The LXH Metal Handrail makes climbing the ladder easier and increases user’s safety and comfort. It is mounted onto upper ladder section. The LXD Insulation Kit provides the standard of tight insulation between the ladder box and ceiling opening needed in energy-efficient construction. It includes: airtight collar, insulation material (sheep wool blocks) and an air permeable collar.